The Charlotte Collection by Parker House features Old English Style with window pane motif on the cabinet door fronts. Made of Poplar Solids and Birch Veneers, this collection is finished in Antique Vintage White. This group offers 62 and 72 Inch TV Consoles with Power Center. Enjoy the quality and style combined with the practical benefits of wire management, storage and lighted display shelves. 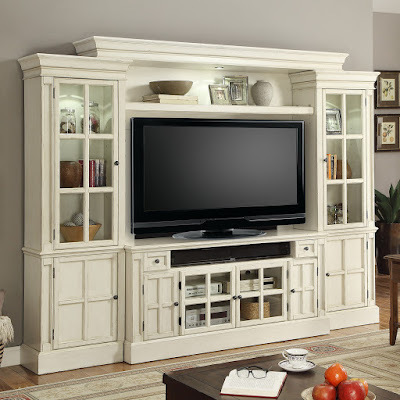 This 4 Piece Set included a 72 Inch TV Console with Power Center, Expendable Bridge, Shelf and Backpanel with wings, as well as two Pier Cabinets.